The Royal Society of Medicine's headquarters at 1 Wimpole Street is always looking to provide the best facilities for delegates and has become the first professional body to install a Sennheiser MobileConnect assisted listening system in the UK. As one of the largest providers of continuing medical education in the UK, the Royal Society of Medicine (RSM) plays a vital role in the health of the nation. 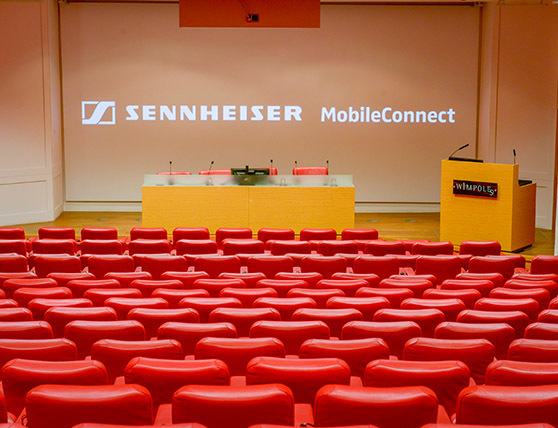 The society’s headquarters at 1 Wimpole Street is also one of central London’s premier conference venues and has become the first professional body to install a Sennheiser MobileConnect assisted listening system in the UK, which has been installed as part of a £200,000 upgrade project in the Guy Whittle Auditorium. The RSM is a longtime user of Sennheiser systems, currently including the SpeechLine digital wireless microphone conferencing system, infra-red assistive listening systems and LSP 500 portable wireless loudspeakers. MobileConnect is a flexible, ‘bring your own device’ (BYOD) system, which uses an app to deliver enhanced audio via WiFi for the hearing impaired, translation and other audio services. The RSM initially investigated MobileConnect because the installation of an induction loop systems presented problems for the 300-seat Guy Whittle Auditorium. “We had installed induction loops in other auditoriums within the RSM, but this particular one is built on a steel frame and there were no plans to rip up the carpets, so we were looking at other ways that we could provide assistive listening,” says 1 Wimpole Street AV manager Kevin McLoughlin. Further advantages of MobileConnect are that the app is very easy to use and the system is remarkably flexible. Installed by St Albans-based Feltech AV, the system was quick and easy to set up. “We just had to introduce four channels from our Biamp Tesira DSP and set up the wireless access point. Another big plus is that you can select channels and the strength of the wireless access point via the MobileConnect browser interface, which takes literally minutes to learn,” says Kevin. Another very attractive feature is that Sennheiser has a clear road map for the future of MobileConnect, rolling out more advantages for users as the technology develops. This development has positive implications for all venues, which Kevin is clearly excited about, and which the RSM will embrace as MobileConnect is rolled out to cover the entire 1 Wimpole Street building. “Some of our digital signage in the public areas runs BBC news 24 hours a day. Obviously we don’t want the audio playing in public areas, so we have subtitles on it.” he says. “Adding it to one of the MobileConnect channels means anybody who happens to have some time and be looking at those screens can add the audio via their mobile device. It’s another benefit that the system will bring to all users, whether they are hearing impaired or not.